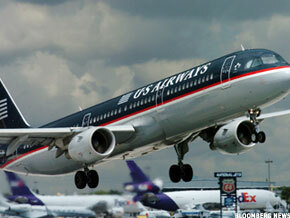 US Airways continues to look for merger with a Big Three carrier, but now sees a five to seven year time frame. TEMPE, Ariz. ( TheStreet) -- US Airways ( LCC President Scott Kirby said the outlook for a merger remains positive, but suggested a time frame of five to seven years. He also said that if a merger requires a move out of the Star Alliance, where US Airways partners with United ( UAL - Get Report), Lufthansa and other global carriers, the cost to switch alliances would be "south of $100 million." Speaking at the J.P. Morgan transportation conference, Kirby said: "We think there's significant value to be generated through another round of consolidation with US Airways," noting "it's probably five to seven years from now that it will happen." A merger would likely pair US Airways with one of the big three carriers: American ( AMR - Get Report), Delta ( DAL - Get Report) or United. "There are three possibilities and 100 paths for how we get from here to there and each has a 1% probability," Kirby said. Membership in Star means "it would be a little easier to consolidate with United than it would be with someone else, but it's not meaningful enough to really be a factor," he said. In the meantime, he said, US Airways will persevere. "From our perspective, on a standalone basis, we do feel good about where we are in this industry," he said. But because its hubs in Charlotte and Philadelphia are in smaller population centers than competing hubs in Atlanta and Newark, US Airways must "make up for it with cost advantages in other areas." Currently, the carrier's biggest cost advantage is lower labor costs, executives have said. But contract talks with pilots and flight attendants continue, with increasing unrest among work groups who are working under contracts signed during a 2005 bankruptcy.